Personally, I like Grand Avenue, but I recommend that people avoid it. 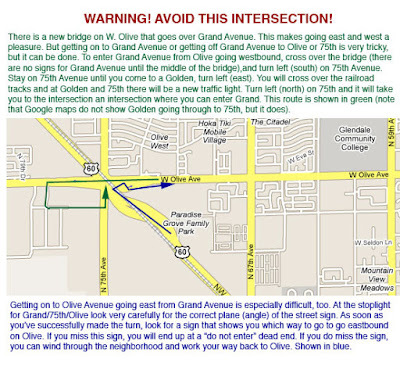 It runs at a 45-degree angle starting at 7th Avenue and continuing up through Glendale, Peoria, Sun City, etc. If you're used to driving the square grid of Phoenix, as most people are, Grand Avenue can be very disorienting. When I recommended to my parents many years ago to avoid Grand Avenue, I was told not to treat them "like old fools". After they got all turned around on Grand Avenue, they later told me that it had been good advice. If you're a Phoenix old-timer, you remember the lights on Grand Avenue that took a loooooong time to change. I used to have cars that tended to overheat at idle, so I stayed away from those lights! Nowadays it's still a good idea to avoid crossing Grand Avenue, unless there is a bridge, as the lights can still be long, and you run the risk of having to wait for a train (the train tracks parallel Grand Avenue). 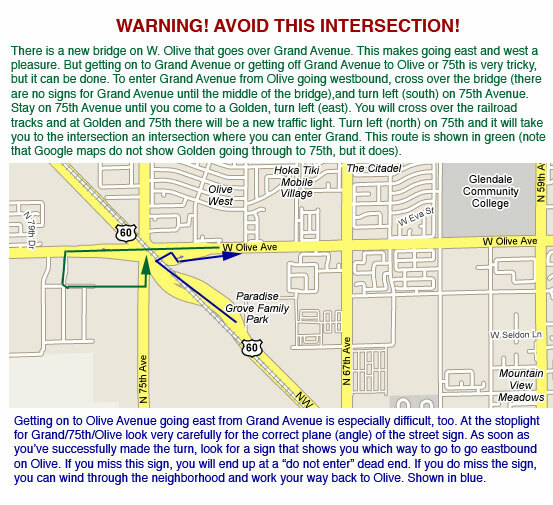 Map of entrance and exit to Grand Avenue at Olive. I made this map in 2006 to help me try to figure it out. They've since improved it, but it's still confusing. A few years ago, improvements were made to Grand Avenue that made it even more difficult to drive. The exits and entrances are so convoluted that it seems as if they were designed as more of a joke than anything else. 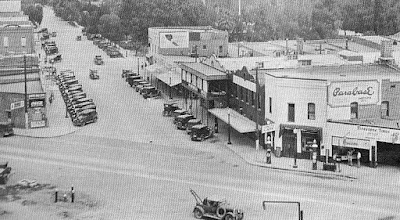 For several years the traffic was very thin on Grand as people discovered that it was very difficult to figure out. I made a point of studying maps, and puzzled out the bizarre exits and entrances, and found it to me kind of fun, like solving a maze. One of my favorite places I called "the street with no name", which isn't far from me, and which had no sign on it until a couple of years ago. 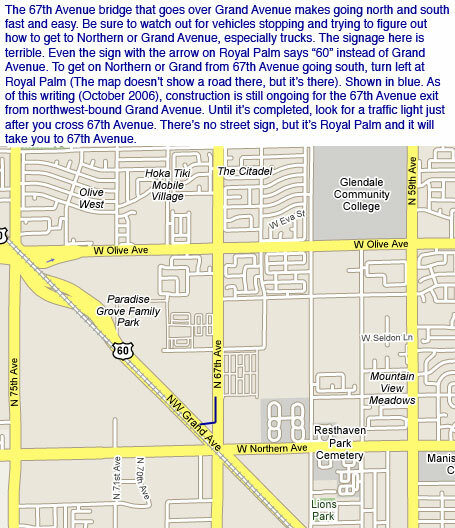 It was my secret exit from Grand which took me to 67th Avenue. They finally put a sign up, and you can tell it's an afterthought, and it just seems kind'a like cheating. The "street with no name" exit in 2006. They've put a sign up now. 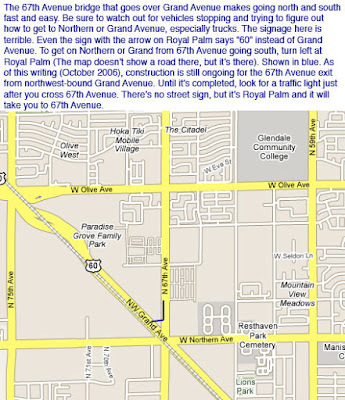 I suppose nowadays if you focus on your GPS, it will guide you along Grand Avenue. And that's probably why Grand is getting more use these days. If you just try to puzzle it out, without looking at a map, you will find it like being inside of a maze, with almost no markings to guide you. By the way, sometimes the signs don't say Grand, they say 60. Sneaky, right? Image at the top of this post: Grand Avenue going past Glendale in the 1920s.